The skyward gaze of one set of eyes belonging to box jellyfish provides evidence that these creatures -- which lack a conventional brain -- are capable of sophisticated behavior. New research has shown that one species of jellyfish uses one set of eyes to navigate and keep itself close to home. Box jellyfish have 24 eyes of four different types, and two of them -- the upper and lower lens eyes -- can form images and resemble the eyes of vertebrates like humans. The other eyes are more primitive. It was already known that box jellyfish's vision allows them to perform simpler tasks, like responding to light and avoiding obstacles. In the new study, scientists found that one species of the cube-shaped box jellyfish, Tripedalia cystophora, uses its upper lens eyes, which are mounted on four cuplike structures, to make sure it stays close to the prop roots of mangrove trees that define its habitat. This species lives close to the surface in Caribbean mangrove swamps where they feed on tiny crustaceans called copepods that swarm in light shafts formed by openings in the mangrove canopy. If the jellyfish stray too far from the mangroves, they risk starvation, according to the researchers. The researchers took photos from underwater looking upward to simulate the jellyfish’s view as it moves away from the mangroves. Using these and a model of the eye, they simulated the image formed in the retina at the back of it, finding that even at a distance of 32.8 feet (10 meters) the jellyfish could still detect the mangrove canopy. They then did a behavioral test using wild box jellyfish in Puerto Rico. When taken 16.4 feet (5 meters) out from their habitat, the jellies rapidly swam back toward the nearest trees. And when placed in a plastic tank under the canopy, the jellyfish swam randomly. But as the tank was moved away from the canopy, the jellyfish began attempting to head back toward it, a behavior that was strongest when they were at between 6.6 and 13.1 feet (2 to 4 meters) out into the lagoon. By the time they were 39.3 feet (12 meters) away, they swam randomly. And if the view of the canopy was obscured, the jellyfish lost their direction. Eyes used for a single visual purpose may represent an early stage in the evolution of visual systems, and this system used by the box jellyfish may require less processing than a system in which a single set of eyes performs many functions -- like ours do, according to the researchers. 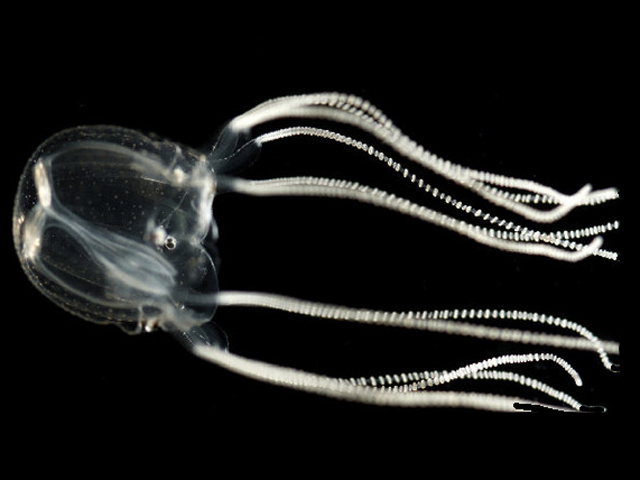 "The box jellyfish solution may thus be linked to the absence of a central brain, but it defeats the idea that a central brain is a prerequisite for advanced behavior," they write online April 28 in the journal Current Biology.